Are lighthouses still used today? What makes the lights in lighthouses so bright? Imagine you're an old sea captain sailing your ship through dark waters. It's late at night and clouds block all the light from the moon. You know you're near land, but you're not sure how close you are. You don't want to run aground and sink your ship. So you keep a close eye out for signs of danger. Then, over there, you see something. It's just a blip of light. But there it goes again! What is it? It's the beacon of a lighthouse helping to guide you safely home. Lighthouses are towers, buildings, or other usually tall structures that shine bright lights to help guide ships at sea. With the help of lighthouses, ships can safely avoid dangerous coastlines and reefs. Lighthouses also help mark the entrances of harbors and bays. The first lighthouses were lit by open fires or candles. Eventually, other substances, including whale oil, lard oil, and kerosene, were used to produce light. Once electric lights were invented, they became the primary light source. The light source in a lighthouse is called the lamp. To reach ships out at sea, the light source must be concentrated and projected. This is accomplished by using a series of lenses that are often called optics. The Fresnel lens, invented in 1822 by French physicist Augustin-Jean Fresnel, allowed the light from the lamp in a lighthouse to be projected great distances. Rotating mechanisms were also introduced to allow the light to be projected in a circular fashion all around the lighthouse, thereby increasing visibility. To be effective, the light from a lighthouse must be high enough to be seen by ships long before they get too close to danger. This led many lighthouses to be designed by architects and engineers as tall cylinders. The cylindrical shape reduces the effect of strong winds. Of course, if a cliff is near the seashore, a lighthouse doesn't have to be nearly as tall. Sometimes, lighthouses have to be built in the water. Dangerous reefs, for example, can exist far off coastlines. In these areas, lighthouses built off-shore can still help ships avoid these dangers. So where is the tallest lighthouse? That might seem like an easy question, but there's actually some controversy about what should be considered a lighthouse. For example, some tall structures incorporate lights that can be used as beacons for navigation. Jeddah Light in Saudi Arabia stands 436 feet tall and has a credible claim as the tallest lighthouse in the world. Other challengers include the 348-foot-tall Yokohama Marine Tower in Japan and the 352-foot-tall Perry Memorial Monument in Ohio. Neither the Yokohama Marine Tower nor the Perry Memorial Monument, however, were built for the specific purpose of being a traditional lighthouse, so some dispute their claims. The tallest traditional lighthouse is widely considered to be 271-foot-tall Île Vierge Lighthouse in France. Built in 1902, it's made of granite and is the tallest stone lighthouse in the world today. Lighthouses are still used today, but they're not as necessary as they once were. Thanks to advances in navigational technology, many lighthouses have been shut down due to the expense of maintaining them. 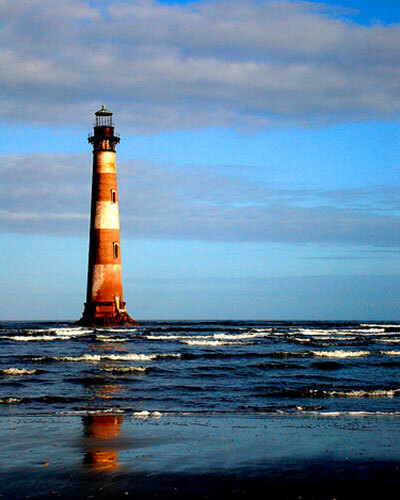 In fact, the last manned lighthouse built in the United States was the Charleston Lighthouse, which was built in 1962. Tomorrow’s Wonder of the Day may have you counting sheep! Feeling crafty? With a few simple supplies, you can build your own model lighthouse. Simply follow the online instructions and you'll be engineering your own unique model lighthouse in no time. Things you'll need include: a large paper plate, markers or paint, a ruler, scissors, an empty toilet paper roll, construction paper, tape, a Styrofoam cup, glue, a wooden bead, and a wooden toothpick. Want to explore the science of light up close and personal? How about building your own flashlight? Follow the online instructions to give you an idea of what will be involved. Be warned, though, this will take a lot of experimentation, thought, and creativity on your part. You'll need several cheap flashlights that you can take apart to examine how they work. You might want to use them for parts, too, as you build your own creation. Be sure to ask an adult for help and permission to disassemble some old flashlights! You have some incorrect information in your last paragraph. The last lighthouse built in the US was not the Charleston Lighthouse, but rather Sullivan's Island Lighthouse in Charleston. You can see it here: http://www.us-lighthouses.com/displaypage.php?LightID=178. You actually show a picture of the Morris Island Lighthouse, built in 1876. See here: http://www.us-lighthouses.com/displaypage.php?LightID=177. And furthermore, there is still a manned lighthouse in the US. The Boston Lighthouse on Little Brewster Island, was never automated. It is still manned by the U.S. Coast Guard. Hope this helps. Thank you, Bryan, for pointing this out to us. We will definitely revise this Wonder. Thanks, again! I still cannot believe that some lighthouses help guide ships, but than what if type boat smash each other then that would be a disaster. That must might have happen to the titanic (just kidding). Cape Hatteras, which is in NC, is the tallest lighthouse in America ... It is 200 feet tall which makes it the 23rd tallest traditional lighthouse in the world. I think the tallest lighthouse is in south of California. I think the tallest light house is in North Carolina! Hello, my name is Briahna and I did not expect today's wonder to be about lighthouses. I have never seen a lighthouse in person, but hope to see one soon! I am truly surprised everyday by your wonders. There are lots of lighthouses along the NC shore and Outerbanks. The nickname for that area is the "Graveyard of the Atlantic" since there have been so many shipwrecks there throughout the years. Hi there. I'm in Mrs. Hess's class and this video is wonderful how lighthouse light up the world! I want to see wonderful videos and also funny videos, too! Who invented the lighthouse? I wonder tomorrow's WONDER is about nails, hair, toys, designs, makeups... and have a wonderful weekends! See you later! The tallest lighthouse is in France. The lighthouse is to be 271-foot-tall. THE TALLEST!!!!!!!!!!!!!!!!!!!!!!! Wow, that is super tall. I don't think I have ever seen a lighthouse before. Thank you! Towers, buildings, or other usually tall structures that shine bright lights to help guide ships at sea are called what? The light source in a lighthouse is called the what? The tallest stone lighthouse in the world can be found in which country?